Hawaii Congresswoman Tulsi Gabbard is running for President in 2020. The Democrat and Iraq War veteran who was first elected to Congress in 2012 told CNN's Van Jones in an interview slated to air Saturday evening that a formal announcement of her candidacy will come shortly. "I have decided to run and will be making a formal announcement within the next week," Gabbard said. Gabbard, 37, is also the first Hindu member of Congress, and is one of the first major candidates to directly declare a presidential candidacy. Thus far only former Maryland Rep. John Delaney has mounted an official presidential bid. Massachusetts Senator Elizabeth Warren announced the formation of a presidential exploratory committee at the end of last year. Gabbard sits on the House Armed Services and Foreign Affairs committees and is currently a Major in the Army National Guard. Within minutes of the news that Gabbard is mounting a presidential campaign, the Republican National Committee (RNC) blasted out a press release detailing her potential vulnerabilities. 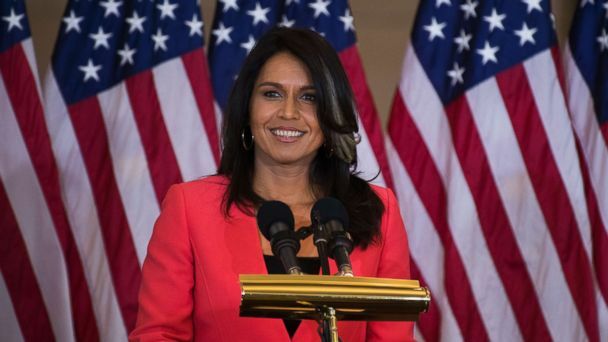 "Tulsi Gabbard has an even bigger problem than her lack of experience - it's that she has no base of support," RNC spokesman Michael Ahrens wrote in a statement released Friday evening.